This titanic and thoroughly comprehensive study of the German experience in Russia is the definitive single volume study of Hitlers War In The East. It incorporates the entire text of The Wehrmacht In Russia written by Emmy Award winning author Bob Carruthers in conjunction with the late Professor John Erickson, author of The Road To Stalingrad and The Road to Berlin. Also featured are dozens of new interviews with the remaining survivors of the war in Russia, encompassing the last testimony of the veterans of the Wehrmacht-Heer and the Luftwaffe. These unique primary sources are complemented by dozens of rare photographs and long forgotten material, based entirely on interviews with the senior German officers who participated in the war, as originally published by the US Army Historical Records Section in the 1950s. The result is a comprehensive and masterful overview of the reality of the war in the east encompassing the weapons, tactics, battles, tanks and aircraft alongside masterful explanations of the strategic and operational aspects, all of which dovetail seamlessly with the view from the trenches in the form of the recollections of the memoirs of the front line veterans. 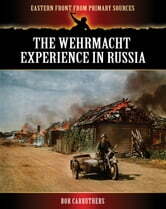 Books related to The Wehrmacht Experience in Russia. An enthraling account of the German invasion of Russia 1941.